Mike Gold is a retired entrepreneur providing his views on various subjects. Photo credit: Frank Hammer. 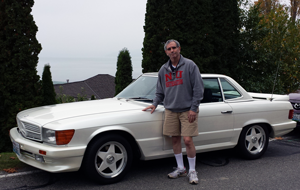 By Mike Gold, a retired entrepreneur "living the dream in the Pacific Northwest." My partner objected to my shot. He claimed that I should not have hit my opponent in the head. I responded by saying that I could not have hit my opponent in the head even if I tried. I did not say I could not hit my opponent. That I can often do. I got to thinking about how I was trained in sports back in New York City. Let’s start with handball. One-wall handball is a very popular sport in New York City. Just about every pocket park and all the larger ones have at least four one-wall handball courts. There is a great handball scene in the movie Sleepers (Brad Pitt and others). Pitt’s character is deliberately “dumping” a murder trial in which some childhood friends have murdered an abusive guard (played by Kevin Bacon) who sexually assaulted both Pitt and his buddies while they were serving time in a reform school. Pitt’s character needs some help from the neighborhood crime figures to help “dump” the case. A “thug” plays handball with another protagonist in the film (another childhood friend who was abused). The point is watching the game of “street” handball or stickball as played in Hells Kitchen (Manhattan) shows the gritty nature of the game and the “thugs” who play it. Street Games - Hells Kitchen NY. One is taught that in any of these games you go for the jugular. Simply put, you take any advantage of your opponent in any way you can. In handball, if that means you deliberately cause the ball to hit your opponent – you win the point and advance towards winning the game. Likewise, in tennis, if you have the opportunity you visualize a target painted on the stomach of your opponent, you aim for the target, and swing with all your might. My Saturday morning tennis partner suggested that I not do that. It seems to me that if I can score a point by causing my opponent to miss, that is the object of the game. When you watch the professional tennis players do exactly this, they will almost always hold up a hand after the point as if to say, “Sorry I hit you.” But in my many decades of watching pro tennis, I have seen this strategy many times. By this same logic one could also argue that you should not lob a ball over the heads of your opponents because they can’t return the ball. Frankly, this is all a bunch of crap to me. When I play at the net, many times my opponent will hit a very hard shot at me with the objective of causing me to miss and scoring a point. I voluntarily choose to stand close to the net. Getting hit with the ball is simply, to me, part of the game. Let’s just follow this logic with respect to all sports. Football: Perhaps the NFL should outlaw tackling. Because someone might get hurt. Basketball: The NBA should outlaw dunking because from time to time, the glass backboard shatters after a thunderous dunk and glass rains down upon all the players under the basket, which might cause an injury. Lacrosse: Perhaps it should be banned altogether. It is played with a very hard leather covered ball – not unlike a baseball. It is fired at over 100 mph towards the goalie with the objective of putting the ball into the net. This is inherently dangerous and many of the defender players clustered in front of the goalie regularly get hit by these shots. Broken hands and fingers are common. Hockey: Another banned sport. Enough said. The hard rubber puck comes at the goalie and the defenders in front of the goal. In the old days, the goalie didn’t wear a helmet or face guard. You’d never see a photo of a hockey player who had his front teeth. Baseball (which is called “hardball” for a reason): Every major league pitcher knows how to throw the brush back pitch, which should be banned. It is a hard fastball aimed very close to the batter – designed to scare and make him back away from the plate a bit, putting him at a disadvantage and making him less able to hit the next pitch that comes over the outside corner of the plate for a strike. Sometimes the pitch hits the batter (who then “walks”). Just this past week, a major league pitcher suffered serious face trauma when hit by a line drive: Reds pitcher hurt by line drive. My conclusion is that sports of all types have their dangers. People get hurt. I’ve never heard of a tennis player getting a concussion from being hit with a ball. (James Blake – a pro tennis player – did suffer a concussion and a spinal injury when he ran headfirst into the tennis net goal post). I intend to continue playing tennis as I was taught. If I get “shunned” from playing this way on the “left coast,” forcing me to develop my “soft” shot, then I will think less of the region. That way, I will be guaranteed to lose every game but improve the self-esteem of everyone else. Hitting someone in the head or eye with a tennis ball can cause a detached or torn retina, which can cause blindness. It sounds like you value winning over everything else. Fair warning to anyone who knows you.